Meanwhile, a spokesman for House Speaker Joe Straus, Jason Embry, said the San Antonio Republican would have preferred a more “transparent” approach. "Speaker Straus is pleased that financial support for the beginning of this deployment has been identified, although he believes a more transparent approach would have been to use the Governor's disaster funds, which Gov. Perry has previously used for border security,” Embry said. Embry said the speaker stands ready to use the authority of the Legislative Budget Board once the Guard's mission is fully underway and the "actual costs of this deployment become more clear." The $38 million Perry plans to use is in addition to the approximately $1.3 million a week DPS estimates it is already spending from its budget to pay for troopers and resources sent to deal with this year’s immigration surge. Almost 203,000 immigrants from countries other than Mexico have crossed the United States' southern border this fiscal year and more than 57,000 of them are unaccompanied children. Most of these immigrants are coming from the Central American countries of El Salvador, Honduras and Guatemala and the majority of this immigration surges crosses into this United States through Texas. Relying on an addition or "rider" to the 2014-15 budget, Perry is transferring unused money originally earmarked for an upgrade to DPS's emergency communications system to fund the guardsmen sent to the border, the governor's office said. He’s able to do that, according to Rich Parsons, a Perry spokesman, because the rider lets Perry use excess revenues for emergency purposes. Perry’s office issued a statement about the uncommon transfer on Friday evening. 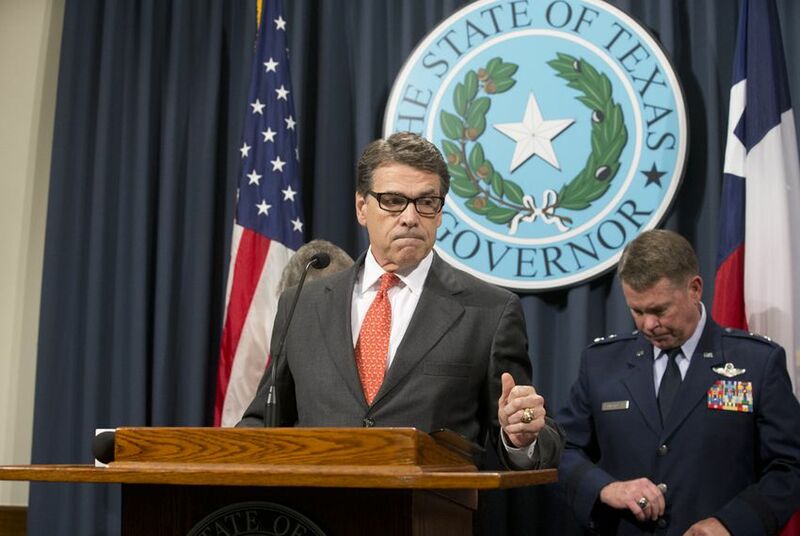 "Through his authority to access certain funds during an emergency, the governor has secured initial funding for the Texas National Guard for the first two-and-a-half to three months of operation,” said Perry spokesman Felix Browne. “The governor will continue working with state leadership to secure additional funding from sources, including the governor's authority to respond to emergencies and disasters and budget execution." The statement came after Sen. Leticia Van de Putte, the Democratic candidate for lieutenant governor, criticized as “vague” the accounting used by Perry to pay for the National Guard. “I strongly believe that it is irresponsible for this state to send our Guard to the border without ensuring they receive the funds they need to complete their mission,” Van de Putte wrote in a letter to the Legislative Budget Board on July 31. Another Democratic senator, José Rodríguez of El Paso, said he wanted to look “closely at questions of the authority for these actions as we prepare for the 84th Legislature." Clarification: A previous version of this story reported that there were more than 57,000 immigrants who have come to the United States this fiscal year from Mexico during the current immigration surge. Story is updated to show almost 203,000 immigrants from countries other than Mexico have crossed the United States' southern border this fiscal year and more than 57,000 of them are unaccompanied children.